Since DML came out with its excellent line of US M2 and M3 based halftrack vehicles, modelers have been trying all sorts of ways to doll them up. 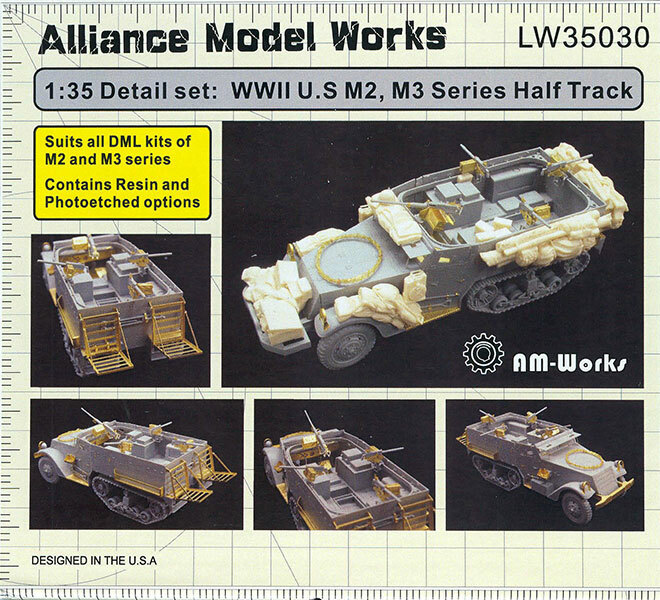 This new kit from Alliance Modelworks provides an interesting set of options: either loading them up with stowage custom designed to fit on the vehicle or to replace it with the basic rack or stowage items that go on the vehicle. The etched parts come on four frets, and one is specifically designed to upgrade the M2 or M3 cab area with non-skid plating over all floor surfaces and the running boards. It also provides for replacing the bumper and winch mounts with etched brass parts. New brass mounts for all kit machine guns are provided (both .30 and .50 calibers) as well as brass and resin ammo cans, plus either brass or resin ammo belts. The kit includes a fret of fasteners as well - tie-down loops, bolt heads and snaps. Lastly it provides a roll of barbed wire which is etched on a single fret as a single part. The modeler must remove it and coil it on his own, but the hard work has been done for you. Each fret is protected on both sides by plastic, and the C fret with the fasteners is “clear etched” with no connecting links to the sides of the fret. All resin parts are neatly cast in tan resin and have mostly minimal cleanup and pour blocks to separate, other than the one-piece rear stowage bin option (usually seen on either modified or M16 MGMC halftracks). But that part is cast perfectly flat and smooth so it is just a matter of sawing off the bottom of the casting. All of the resin parts come wrapped in foam padding to ensure against breakage. While no finishing instructions are included the kit does provide a decal sheet of waterslide decals for the ammunition boxes and for the dashboard, with the proper silver speedometer dial included. Overall this is a nice set and while appearing expensive actually does provide sufficient bits to have one vehicle loaded down and one empty, so it covers two bases at once.